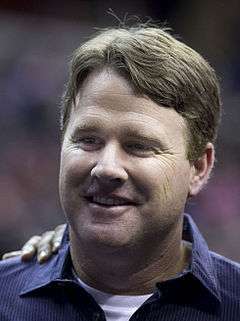 Jay Michael Gruden (born March 4, 1967) is an American football coach and former quarterback, who is the current head coach of the Washington Redskins of the National Football League (NFL). During his time in the Arena Football League (AFL), he won four ArenaBowls as a player and two more as a head coach. His brother is former head coach for the Oakland Raiders and Tampa Bay Buccaneers and current Monday Night Football analyst, Jon Gruden. Gruden was born in Tiffin, Ohio, and was raised a Roman Catholic. He attended George D. Chamberlain High School in Tampa, Florida, where he played quarterback for the Chamberlain Chiefs high school football team under head coach Billy Turner. Gruden played two seasons in the World League of American Football (with Barcelona in '91 and Scotland in '95). He also spent 3 seasons of time in the NFL (Phoenix) and CFL (Sacramento) on practice squads. Gruden won four ArenaBowl titles as the starting quarterback of the Tampa Bay Storm in the Arena Football League. He was named the league's MVP in 1992. From 2002 to 2008 he served as an offensive assistant for the Tampa Bay Buccaneers in the National Football League under his brother, head coach Jon Gruden, earning a Super Bowl ring for the Bucs' win in Super Bowl XXXVII. He left the team after his brother was fired following the 2008 season. On January 9, 2014, Gruden was hired as the new head coach of the Washington Redskins, succeeding Mike Shanahan. Since Gruden was a highly sought after coach, Redskin's owner Dan Snyder, gave him a fully guaranteed, 5-year contract worth $20 million. In the 2015 season, Gruden led the Redskins to their first playoff appearance since 2012. The Redskins would go on a 4-game winning streak to finish the season, and lead the NFC East with a 9–7 record. However, the Redskins lost to the Green Bay Packers in the Wild Card round 35–18, ending their season. Gruden's father, Jim, a long-time college and NFL assistant coach, was a former regional scout for the San Francisco 49ers. His brother Jon was the head coach of the Oakland Raiders and Tampa Bay Buccaneers, and is now a Monday Night Football analyst for ESPN. His other brother, James, is a radiologist at the Mayo Clinic. On September 16, 2005, Gruden was arrested in Hillsborough County, Florida and charged with driving under the influence of alcohol. Gruden registered 0.106% and 0.110% in two blood-alcohol tests, each over the legally allowed limit (0.08%) for driving in Florida. He pleaded no contest to reckless driving and was fined $750. 1 2 3 Jamison Hensley (February 3, 2011). "Bengals hire Jay Gruden". www.sports.espn.go.com. ESPN Internet Ventures. Retrieved January 13, 2014. ↑ Damon Hack (August 24, 2011). "Postcard from camp: Bengals". Sports Illustrated. Retrieved January 13, 2014. ↑ "Louisville Cardinals Passing Records". www.gocards.com. University of Louisville. Retrieved January 13, 2014. ↑ "Gruden Named 4th Greatest in AFL History". www.tampabaystorm.com. Tampa Bay Storm. August 2, 2012. Retrieved January 13, 2014. ↑ "Jay Gruden". www.coachingroots.com. CoachingRoots.com. Retrieved January 13, 2014. ↑ "2002 Tampa Bay Buccaneers Coaching Staff". www.coachingroots.com. CoachingRoots.com. Retrieved January 13, 2014. ↑ Chris Hays (February 10, 2010). "UFL names Jay Gruden new Tuskers coach, but big news is that Orlando becomes sole residence for Tuskers". Orlando Sentinel. Retrieved January 13, 2014. ↑ Gregg Rosenthal (February 3, 2011). "Jay Gruden to Bengals confirmed". www.profootballtalk.nbcsports.com. NBC Sports. Retrieved January 13, 2014. ↑ Josh Kirkendoll (January 12, 2012). "Confirmed: Bengals Sign Jay Gruden To A Three-Year Extension". www.cincyjungle.com. Vox Media, Inc. Retrieved January 13, 2014. ↑ Jamison Hensley (January 13, 2012). "Wake-up call: Jay Gruden signs extension". www.sports.espn.go.com. ESPN Internet Ventures. Retrieved January 13, 2014. ↑ Marc Sessler (January 8, 2013). "Jay Gruden plans to interview with Eagles, Cardinals". www.nfl.com. National Football League. Retrieved January 13, 2014. ↑ Bill Williamson (January 13, 2013). "Chargers interview Jay Gruden". www.sports.espn.go.com. ESPN Internet Ventures. Retrieved January 13, 2014. ↑ Boyer, Zac (January 9, 2014). "Jay Gruden hired as Redskins coach". WashingtonTimes.com. Retrieved 2014-01-09. ↑ John Keim (January 9, 2014). "Jay Gruden to coach Redskins". www.sports.espn.go.com. ESPN Internet Ventures. Retrieved January 13, 2014. ↑ Jason LaConfora. "Jay Gruden's deal with Redskins includes rare five guaranteed years". ↑ "Redskins' new coach had family football foundation". Redskins XTRA. ↑ "Jay Gruden Mugshot – 09/16/05 Florida Arrest". arrests.org. ↑ Mitch Stacy (September 16, 2005). "Brother of Bucs coach Gruden charged with DUI". www.usatoday.com. USA TODAY. Retrieved January 13, 2014.